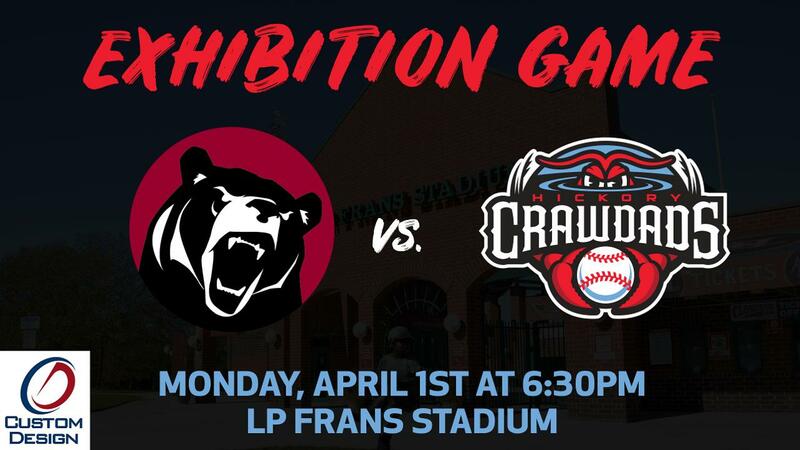 Hickory, NC- The Hickory Crawdads are excited to announce an exhibition game against the Lenoir-Rhyne Bears on Monday, April 1st, presented by Custom Design. The game will begin at 6:30pm with gates opening at 5:30pm. All tickets will be general admission seating and free of charge compliments of the YMCA of Catawba Valley. The YMCA will be on site collecting donations for their local programs from those who wish to donate. The YMCA of Catawba Valley is dedicated to building healthy, confident, connected and secure children, adults, families and communities. One way the YMCA provides long lasting impact in the community is through their Annual Campaign. They help youth be able to participate in programs and sports, children receive quality child care, and parents and families enjoy better health and fitness through membership support. Each year the YMCA of Catawba Valley provides over $700,000 in financial aid to the community. Nat Auten, President/CEO of the YMCA of Catawba Valley, said, "The Y is able to provide support for thousands of people because of the amazing support from the community. We are very excited to partner with the Crawdads this year for the exhibition game and raise awareness for the YMCA." Concessions and the Catawba Farms Crawdads Café will be open during the game to serve refreshments and food. The Crawdads are looking to build off a strong finish in 2018 that saw them fall just shy of a playoff berth. The Bears enter the 2019 season ranked sixth in the South Atlantic Conference preseason poll. The Bears have won the last two matchups, defeating the 'Dads in 2015 and 2016. The exhibition in 2017 was rained out while scheduling conflicts prevented them from playing last season. The exhibition game will be the first opportunity to see the Crawdads in action in 2019. The 'Dads will open the regular season against the Lakewood Blue Claws on the road on Thursday, April 4th. They are scheduled to play four games there before heading to Greensboro for three games to conclude the road trip. The Crawdads home opener is scheduled for Thursday, April 11th against the Kannapolis Intimidators at 7pm. Individual game tickets will go on sale online on Friday, March 22nd. They will be available at the stadium at the Spring Fling on Saturday, March 23rd. Group tickets, luxury suites, and party patios are currently on sale for all 70 games. For more information or to book a group outing please call (828) 322-3000 or stop by the Crawdads front office Monday-Friday from 9am to 5pm.